Sleeper teams: Which squads could surprise in 2016? National championship contenders are easy to identify before the season, but these teams could defy preseason rankings and notch more wins than expected. Alabama and Clemson will begin this season as national title contenders after squaring off in the College Football Playoff final a year ago. Also in the hunt are Oklahoma, Stanford, Florida State and a handful of other programs that bring back a lot of the talent and depth that helped them shine in 2015. Identifying these teams is relatively easy, but prognosticators will have a much more difficult time marking the sleepers, the programs hovering below the preseason playoff conversation who could outperform expectations. Landing a spot in the top four may be a longshot for the 10 listed below, but all of them look capable of surprising in a good way. None of the programs in our preseason top 25 were eligible to be featured in this analysis. The Tigers entered last season as a perceived playoff threat led by a Heisman Trophy contender (Jeremy Johnson) at quarterback. Then what happened? They barely survived FCS foe Jacksonville State, Leonard Fournette ran wild during a 45–21 rout in Baton Rouge, Johnson was relegated to the bench and the Tigers needed to win two of their final four regular season games just to make a bowl. Throughout Auburn’s nightmare season, it was hard to shake the feeling that the program was underperforming relative to its talent level—a feeling that will return in 2016 if the Tigers don’t 1) find an answer at quarterback, 2) develop a workable ground game following the dismissal of top tailback Jovon Robinson and 3) tighten the screws on defense after finishing 10th in the SEC last season in yards allowed per play. Junior college transfer John Franklin III could help on the first count (he’ll need to beat out Johnson and sophomore Sean White), sophomore running back Kerryon Johnson seems ready for a bigger load and junior Carl Lawson gives the Tigers an A-lister at defensive end under new coordinator Kevin Steele. However, a nightmare schedule, starting with a non-conference bout against Clemson and dotted with trips to Ole Miss, Georgia and Alabama, won’t help. The goal this season for Miami should be to lay the foundation for a successful tenure for new coach Mark Richt, to begin riding a positive trajectory under a proven winner while leveraging the optimism into recruiting victories that will pay off in years two, three, four and so on. Moderate success would be acceptable in the wake of Al Golden’s frustrating five-year run. But Miami really could do better than that. Whereas many first-year coaches are bequeathed talent-deprived rosters by their predecessors, Richt gets one of the best quarterbacks in the country (Brad Kaaya), an imposing stable of running backs (Joseph Yearby, Mark Walton, Gus Edwards), a proven pass-catching target (Stacy Coley), two serviceable tight ends (David Njoku and Chris Herndon IV) and highly regarded freshman playmakers (Ahmmon Richards, Sam Bruce). The defense, well, needs work (it ranked 86th nationally in yards allowed per play and 77th in points allowed last season), but there’s reason to believe it could be better with Manny Diaz taking over the unit and Craig Kuligowski stepping in to coach the line after a long, successful run at Missouri. Plus, few Power 5 divisions offer more favorable competitive conditions for a first year coach than the ACC Coastal. For a blueprint of a dream season, Minnesota need look no further than 2015 Iowa. The Hawkeyes rode a favorable Big Ten West schedule to 12 wins and a spot in the Rose Bowl. No, Iowa wouldn’t have been able to compile that many wins if it weren’t talented, but its path to playoff contention was far more manageable than what other squads of similar quality faced. This year, the Golden Gophers gets the scheduling luck the Hawkeyes got last year. Minnesota draws Rutgers and Maryland as East division crossover opponents. You can concoct not-insane scenarios where the Gophers win all of their road games (Nebraska and Wisconsin will be tough, sure). And Iowa—which may be Minnesota’s chief competition in the West this season—comes to Minneapolis in October. With veteran quarterback Mitch Leidner and ample skill talent—wideout Drew Wolitarsky, tight end Brandon Lingen, leading rushers Shannon Brooks* and Rodney Smith—returning, don’t rule out Tracy Claeys’s crew making a run to the conference championship game. Whether the Gophers would have any shot of beating the team that emerges from the East is a question we can set aside for now. *Brooks reportedly could miss the start of the season because of a foot injury. There would be a lot more optimism about Nebraska’s future under second-year coach Mike Riley had the Cornhuskers performed even a little bit better in a series of close games last season. There was the 33-28 loss to BYU on a Hail Mary, the overtime defeat at Miami, the one-point loss at the hands of Illinois—and you get the point. It’s unlikely Nebraska will come out on the wrong side of so many tight contests again in 2016; perhaps the tide started to turn last November, when the Huskers upended Michigan State by one in Lincoln (thanks, in part, to a questionable call on the game-winning touchdown). Setting aside the possibility of the football gods looking more favorably upon Nebraska, it gets key skill guys back on offense in receiver Jordan Westerkamp and running back Terrell Newby, plus experience under center in Tommy Armstrong Jr. Yhe Huskers will also benefit, to a lesser degree, from the same thing as the team above them on this list: a manageable schedule. The Big Ten West is wide open, and Nebraska is more than capable of winning it. Two games in November, against Minnesota (Nov. 12) and at Iowa (Nov. 25), will go a long way toward determining whether the Huskers pull it off. Yup, another team from the Big Ten. Unlike its conference mates on this list, though, Penn State has to deal with Michigan, Ohio State and Michigan State in the Big Ten East. Fortunately, the Nittany Lions face two of those teams (the Spartans and Buckeyes) in Happy Valley, and their non-Michigan road games (Purdue, Indiana and Rutgers) should result in wins. Penn State is losing quite a bit along its defensive front in Anthony Zettel, Carl Nassib and Austin Johnson, and coordinator Bob Shoop left for Tennessee this off-season. But the rest of the unit, which ranked 14th nationally in Football Outsiders’ S&P+ last season, should be in decent shape, with junior Jason Cabinda heading a promising linebacking corps. There’s more intrigue on the other side of the ball, where former Fordham head coach Joe Moorhead is installing an up-tempo scheme and junior quarterback Trace McSorley, after an impressive performance in the Nittany Lions’ spring game, looks to have the edge over sophomore Tommy Stevens in the battle to replace Christian Hackenberg. Sophomore Saquan Barkley is a rising star at running back, and Penn State has weapons on the outside in wide receivers Chris Godwin and DaeSean Hamilton. There’s a lot to like about this team, but it may not be enough in a brutal division. Florida State and Clemson are the obvious frontrunners in the ACC; it’s even possible both of them will make the playoff. But the Panthers could rival Louisville as the third best team in the conference. Pitt showed promise in coach Pat Narduzzi’s first season (double-digit-point wins over the Cardinals and Duke in November were impressive) and it brings back plenty of production on both sides of the ball (72%, according to SB Nation’s Bill Connelly). Sophomore safety Jordan Whitehead should make the leap from “talented youngster” to “national star” after winning the ACC’s Rookie of the Year award last season, and it’s clear Narduzzi, uh, knows a thing or two about putting together elite defenses. 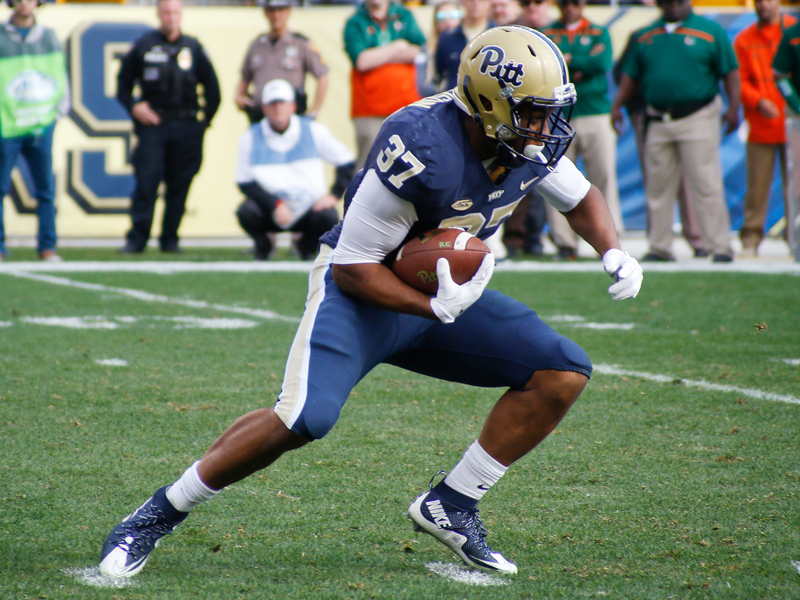 Though Pitt may have a difficult time replacing ace wideout Tyler Boyd while undergoing a coordinator change (Jim Chaney out, Matt Canada in), seasoned quarterback Nate Peterman can lean on two of the better running backs in the conference not named Dalvin Cook—James Conner and Qadree Ollison. If Miami can’t seize the Coastal Division and North Carolina slips after last year's 11-win season, maybe the Panthers will fill the void at the top. Houston is considered a playoff contender and the clear favorite in the American Athletic Conference entering this season (we have them ranked eighth overall). But there’s room for another power to emerge from the AAC, and the Bulls are the best bet. USF probably would be garnering some more recognition as a dark-horse Group of Five access bowl candidate had it managed to top Western Kentucky in the Miami Beach Bowl last year (and received an attendant “bowl bump”). But that one defeat came after a dominant stretch in which the Bulls won seven of eight—with their only loss coming at an 11-win Navy squad— and bludgeoned Temple (Nov. 14), Cincinnati (Nov. 20) and UCF (Nov. 26) by a combined score of 153-53. Quarterback Quinton Flowers is back to run the show on offense, and Marlon Mack is one of the best tailbacks outside of the Power 5 conferences. South Florida does have to face Northern Illinois and Florida State in September, but it should be able to navigate its AAC slate with little trouble. Hopefully we’ll get to see the Bulls test themselves against the Cougars in the conference championship game. It is not inconceivable that Texas starts the season 1–4, stumbles a couple more times over a tricky four-game league stretch (at Kansas State, Baylor, at Texas Tech, West Virginia), fails to qualify for a bowl game, and athletic director Mike Perrin hops on a plane to Houston to meet Tom Herman after giving Charlie Strong his walking papers. But this also could be the year in which Strong’s rebuild bears fruit in the form of an eight or nine-win season. There’s talent back on defense, most notably stud linebacker Malik Jefferson. Plus, quarterback Shane Buechele should fit well in new offensive coordinator Sterlin Gilbert’s attack, and the true freshman will have pieces to work with in wideout John Burt and running backs D’Onta Foreman and Chris Warren III. By early October, we’ll have a pretty good sense of whether this pick looks more like a proper assessment of Texas’s on-field quality or a product of premature optimism over an exciting National Signing Day. Four of the Longhorns’ first five games are against Notre Dame, at Cal at Oklahoma State and vs. Oklahoma. Is this dumb? This is dumb. The Aggies have spent the time since their final regular season game of 2015 (a 12-point loss at LSU) doing the sorts of things—from losing two former five-star quarterback recruits to transfers, to having one of those QBs publicly decry the program’s culture, to an assistant coach subtweeting recruits, to other assistant coaches giving a sexist presentation at a fan event—that suggest a program on the verge of a colossal collapse. Yet it’s difficult to write off the Aggies, even in the most challenging division in the country, given what they bring back on both sides of the ball. Texas A&M has a dynamic receiving corps led by Christian Kirk and Josh Reynolds. It returns a terrific tandem of defensive ends Myles Garrett and Daeshon Hall surrounding a standout in the middle of the line (Daylon Mack). And it adds a graduate transfer (Trevor Knight) who—by virtue of slaying Alabama for 348 yards and four touchdowns in the 2014 Sugar Bowl while with Oklahoma—may strike more fear into Nick Saban than any other quarterback in the country (Deshaun Watson excepted). By the time the Aggies travel to Tuscaloosa to face the Crimson Tide on Oct. 22—after meetings with UCLA, Auburn, Arkansas and Tennessee—we should know how good they are. The Utes delivered arguably the most shocking result of 2015 at the time, a 62–20 romp of Oregon in Eugene, and rose to as high as No. 3 in the AP poll. But a convincing loss at USC in October and a pair of single-digit defeats in November (at Arizona and against UCLA) kept Utah out of the playoff picture. Yet in evaluating the Utes entering this season, it's important not to lose sight of what they accomplished over their first six games of 2015 or underestimate the possibility that they will regain something approximating the form that made them look, for a short stretch, like one of the best teams in the nation. Star running back Devontae Booker (out of eligibility), starting quarterback Travis Wilson (out of eligibility) and leading receiver Britain Covey (LDS mission) are gone, but a defense led by tackle Lowell Lotulelei and ends Hunter Dimick and Kylie Fitts should keep coach Kyle Whittingham’s group in contention in the Pac-12 South. With no clear-cut No. 1 in the division among USC, UCLA and Utah, why not the Utes? They’ll have a few chances to notch big wins, as the Trojans, Washington and Oregon all visit Rice-Eccles Stadium.